Speaking of finding inspiration, this afternoon I visited the Renegade Handmade Store on Division Street. Among seven thousand things I wanted to buy, I found this book, How to Build a Fire: And Other Handy Things Your Grandfather Knew. By the end of the title page I had tears in my eyes. It’s hard to think about my grandfather, Grandpa Don, without thinking of the roaring fires he’d make in his oversized fireplace on the apple orchard. He and Grandma Joyce left the orchard ten or so years ago now, but I can still so clearly picture him hauling fresh-cut wood across the orchard in his tractor wagon, stacking it neatly in a tall, narrow pile (which served as an excellent barrier between teams of cousins throwing things at each other), and dragging in several cut sections to throw on a huge, loudly crackling fire at Christmastime. That crackle was the background noise of every winter family gathering. Even with the noise of us kids running and falling, of people talking, of Grandma Joyce cooking, there’d be that crackle. Don’t get me wrong—fire-building is only one mere mention in this book. But it captured my attention. I kept paging through, seeing things I could vividly picture Grandpa doing (how to break bad news, how to choose and buy a suit…), and some I remember Grandma Joyce doing, for that matter (how to strip and refinish wood furniture). I like to try to be self-sufficient, in general. But it’s impressive to me that both of my grandparents learned to do so many things themselves. Before my precious Google. That feeling of awe and appreciation is perfectly captured in this book. All I could think about as I thumbed through was how much I’d love to write something similar, about Grandma Joyce. 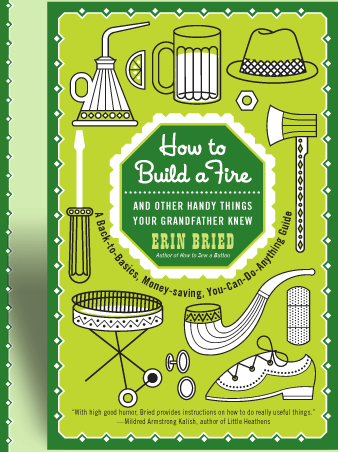 As it turns out, the author, Erin Bried, has also written a companion, How to Sew a Button: And Other Nifty Things Your Grandmother Knew. I’ll have to order myself a copy; both of these books are perfect resources for the Bardsley projects. It’s a great blessing to find anyone who inspires you at any stage of your life. Mine is my grandparents, and their willingness to educate themselves. To learn from their own experiments. It really does something to you when you find your source of inspiration, embrace it, and run with it. That’s what I’m trying to do now, and I’m glad I can tap into the little community Erin Bried created with these books.